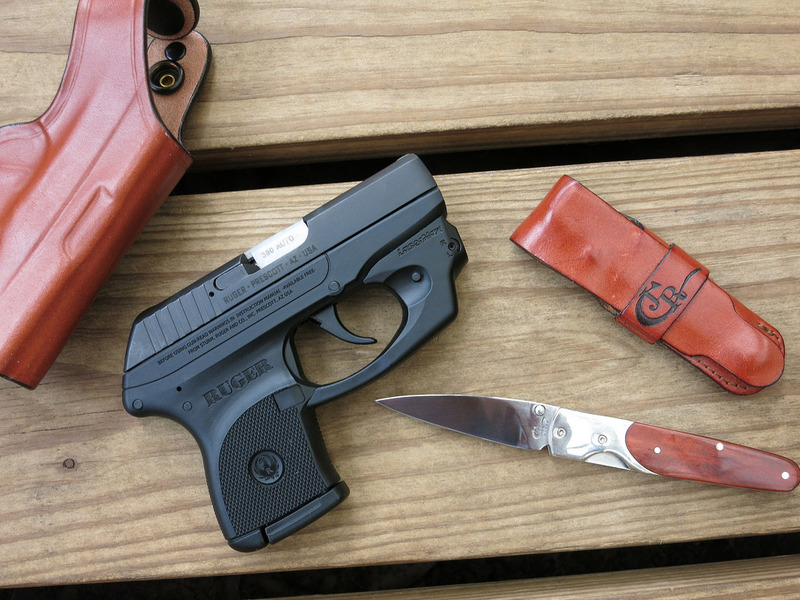 Chances are, if you have a conceal carry .380 pistol, it may be the Ruger LCP. These little guys are perfect for hiding away in a pocket or backpack or even on your ankle, and they provide the self defense you need for those scary, once in a lifetime moments. We’ve sifted through reviews and products online and put together our own review of the best Ruger LCP pocket holsters. We’ll let you know what we think is the best purchasing option for the everyday conceal carry gunowner at the end of this article. We cover a variety of budgets in our holster reviews, and this time we did add in a wallet holster option as well. While pocket holsters are more common, wallet holsters are great for anyone who would prefer concealing their weapon in their back pocket. Whichever your choice is, these four holsters listed below are a great starting point to deciding on which holster will be best for you. 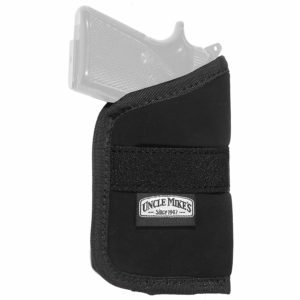 Materials – The Uncle Mike’s Ruger LCP Holster is an open topped pocket holster made of nylon. It’s coated in a special laminate to protect your pistol, conceal any recognition or print-through, and it also blocks sweat and dirt. The non-slip band around the center of this nylon holster keeps your Ruger LCP secured in place while it’s holstered, and also allows for a smooth and clean draw when it’s needed. The open top design provides just enough exposure to grab the grip, but prevents the movement of gun levers, buttons, and any catches on clothing or other exterior things. The size 2 option will fit most 380 pistols, and it’s one of the best Ruger LCP holsters on the market. Performance – Uncle Mike’s makes some pretty great and popular accessories and tools for gunowners, and their pocket holster for Ruger LCPs is no exception. 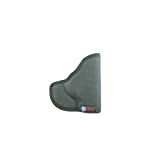 Despite its low price, this is a great pocket holster made with good quality nylon and stitching. We’re most impressed with the special laminate, which protect pretty much anything from getting to your concealed weapon, and there’s essentially no printing seen through the holster. Our one complaint is that for some, the non-slip band is a little too tight, and you might want to stretch it out so you can draw your Ruger LCP without the whole holster coming up with it. It’s a pretty easy fix if you need it. What we say – Uncle Mike’s Ruger LCP Pocket Holster is the cheapest option within this review, and it costs less than $15 online. Despite the one flaw of the band being a little tight, this is a great pocket holster for anyone with a small budget. 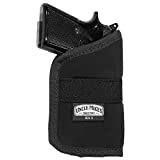 The Uncle Mike’s name is a pretty trustworthy brand name, and their holster would be a good purchase. Materials – The DeSantis Ambi Nemesis Ruger LCP 380 Holster is made of a slick pack cloth with a special exterior pattern for gripping to the inside of your pocket. The material is comfortable but firm enough to keep its shape and protect your Ruger from any dust or lint getting into the barrel. The holster covers just enough of the trigger guard to leave enough room for you to confidently grab your firearm in a single go. The core of the holster is also padded just enough to conceal the outline of your gun without adding too much bulk to the inside of your pocket. The DeSantis Ambi Nemesis Holster is ambidextrous and made in the U.S.A. Performance – The DeSantis Ambi Nemesis Ruger LCP 380 Holster is another really great option for a low cost. The specially designed patterned material on the outside of the holster is really good for keeping a grip inside of your pocket. 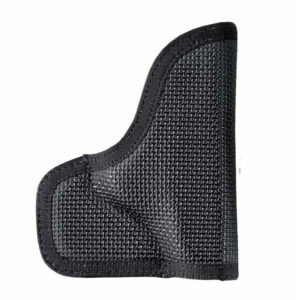 We do want to point out, however, that the description of this holster says slick and not sticky; it won’t stay adhered to the inside of your pocket, but it should come out with your firearm when you draw either. It’s also very good at keeping dust a debris out of any nooks and crannies. We will say that it does not necessarily fit all 380 pistols with attached lasers or lights. This is probably a better option if you keep your conceal carry free of any bulky accessories. What we say – The DeSantis Ambi Nemesis Pocket Holsters for Ruger LCP cost just over $15, so this is another great option for anyone with a low budget or just needs a quick solution for their conceal carry. You should also expect this holster to last for a decent amount of time, but it’s very cheap to replace if needed. Materials – The Don’t Tread on Me (DTOM) Combination Ruger LCP Pocket Holster is made of tough and textured nylon, which is specifically shaped to fit the Ruger LCP 380 and a few other low caliber pistols. Not only is it usable as a pocket holster, but it also comes with a metal clip for attached inside of the waistband. This means that it will have to be purchased as a left handed or right handed holster. 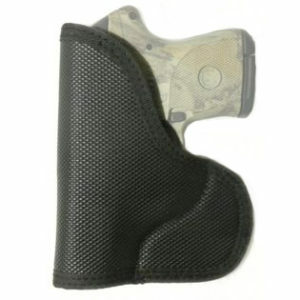 The core of this holster is padded with foam to break up the outline of your firearm and to block printing. It covers up to the majority of the trigger guard and leaves just enough of your conceal carry exposed for easy grabbing and drawing. This option even comes with a thirty day money back guarantee. Performance – The DTOM Combination Ruger LCP 380 Holster is a pretty sturdy holster that doesn’t bend much or allow for any dirt getting in. On one hand, it’s pretty neat that you can switch between using it as a pocket holster and an inside the waistband holster. You can even use it as a small of the back holster with your opposite hand, if you can. On the other hand, that means the exterior of this holster isn’t sticky so it can still be comfortable to wear IWB. That’s great for your hip, but not great for the inside of your pocket. However, if you’d prefer dual use out of your holster, this is still a great purchase to make. What we say – This combination pocket and IWB holster sells for just over $20 online, which is still a good price for most buyers. If you’re looking to get the most out of a pocket holster, you’ll definitely achieve that with the DTOM Ruger LCP Holster. Materials – The Talon Ruger LCP Wallet Holster is designed and manufactured in the United States, and the concept was put together by law enforcement professionals. The body of the holster is made of Hermann Oak American Steerhide Leather, and it’s molded specifically to fit low caliber conceal carry firearms. The quality stitching nest to the trigger guard provides great retention, and the flat back panel makes your firearm invisible in your back pocket. 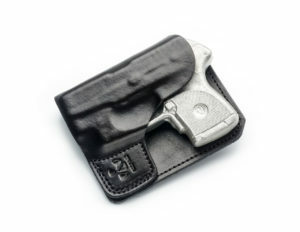 You can feel safe and confident with your Ruger LCP 380 concealed in this wallet holster. Performance – The Talon Ruger LCP Wallet Holster offers a different option from your average pocket holster, and it provides an incredibly secure concealment, ensuring that nobody will visibly notice your hidden firearm. The leather material used for this holster is incredibly high quality, and you won’t have to worry about having to replace it – although it does come with Talon’s “No Bull Guarantee”. With that in mind, a wallet holster like this can make sitting a little uncomfortable. For some, this can be an issue if you spend a lot of time at a desk or in your car. What we say – With its high quality materials and special design by law enforcement professionals, the Talon Wallet Holster will cost you around $50 online, making it the most expensive option within this review. However, if you prefer wallet holsters over pocket holsters, we definitely feel this is a worthy investment. We’ve decided that our pick for the best pocket holster for the everyday gunowner is the Desantis Nemesis Holster. We normally don’t pick one of the most cheapest options, but we find this style of pocket holster is one of the most popular and effective choices for concealment of small caliber weapons. The padding and grip of this choice keeps your Ruger LCP safe and free of debris, and drawing your weapon should be very simple after a little practice. We absolutely believe you should consider the DeSantis Ambi Nemesis for your purchase.